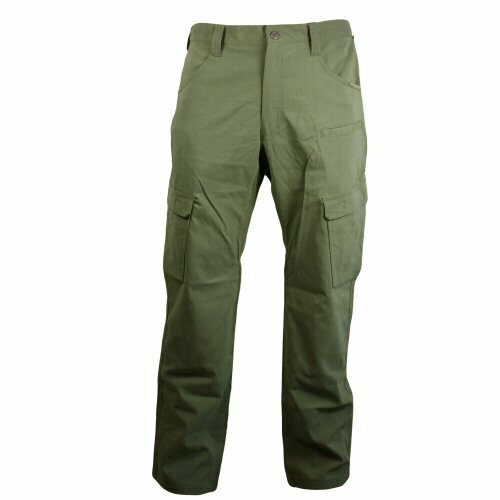 With these trousers, Propper have produced tactical wear with a difference! Lightweight, breathable and comfortable with widened upper thigh provided by a gusseted crotch dart - helping to reduce stress points in the crotch area and reduce thick, uncomfortable seams. The fabric combines breathability with wind resistance and a durable water repellent finish that lets water drops bead off the surface. The fabric also incorporates spandex to allow it to stretch for movement. Belt loops will fit a 40mm wide belt and include a secondary loop behind the main loop for comms wire, attachment of carabiners or keychains. 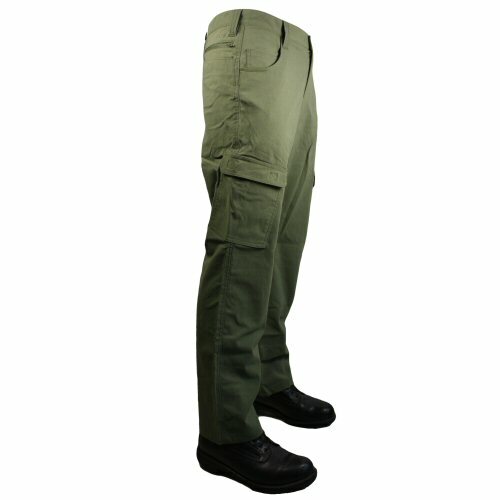 Pockets include two large leg cargo pockets which are set at an angle for easy access and incorporate magazine dividers inside, a smartphone pocket on the left front, two waist pockets with reinforced opening to allow for clipping of utilities, penknife pocket in right waist pocket, large dump pockets on rear left and right, zip-up seat pockets on left and right, hidden back of waist pocket just under waistband. Trousers open with press button in the front and metal zip. The zip under-placket can be buttoned beneath the zipper. 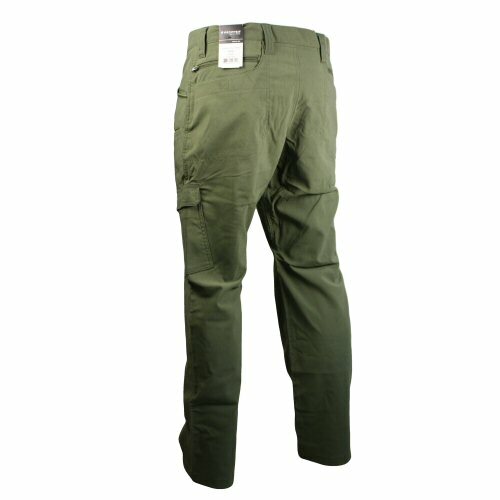 These trousers are in Propper's Olive Green which is similar to OG107. 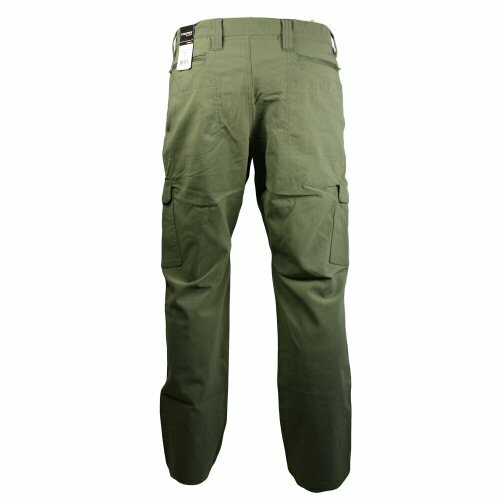 Made in 7.2oz 96% Nylon, 4% Spandex and designed to be worn at mid-rise level (slightly below the navel) for reduced weight and drag, active wear, practical and tactical use and cross-country trekking. Sizes are in inches, waist x leg. Available options are: 34x32 , 36x34 , 38x34 , 40x32 , 42x32 , 44x32 . Rear of the trousers, angled to show the seat dump pocket with zip compartment above. The gap between the two belt loops on the rear conceals a back of waist pocket. A full view of the rear of the trousers. The right side of the trousers, showing the angle of the leg pocket. 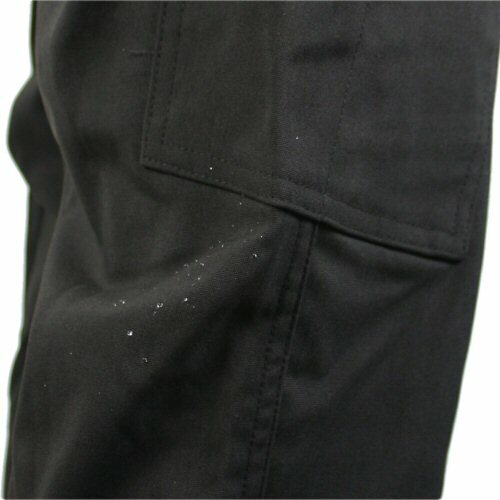 A water test on the black version of the trousers showing the effect of a cup of water poured on the trouser leg. The water beads off the surface and remains in beads where the angle of the fabric has caught the water. This can be easily brushed off.